Exploring - Blog from Manhattan, New York | I'm dreaming of a white Christmas!! I'm dreaming of a white Christmas!! Not long after we arrived, we noticed the daily queue outside a bagel shop in the next street. We googled it and found Ess-a-Bagel had a reputation for having the best bagels in NYC. We decided to check it out for brunch this morning. We stood outside the store in the queue for about 15mins and then at least another 20mins inside the shop. There were about 10 different varieties of bagel to choose from and at least 15 different flavoured cream cheeses. They included olive, lox, spring onion, Oreo, chocolate chip, strawberry and vegetable. There were also a huge number of fillings to choose from and they piled it on. The bagels were delicious!! Afterwards we caught the train down to SOHO. We wandered around the stores and went into a Converse store where they had a floor dedicated to limited editions. You could also design your own pair - choosing the fabric, the laces, the badge etc. SOHO led onto Little Italy. We wandered along Mulberry St which had a huge number of restaurants with staff out the front trying to get customers in. There were also a lot of places selling cannoli and Italian pastries. We stopped at one that advertised 'the best cannoli on planet earth'. 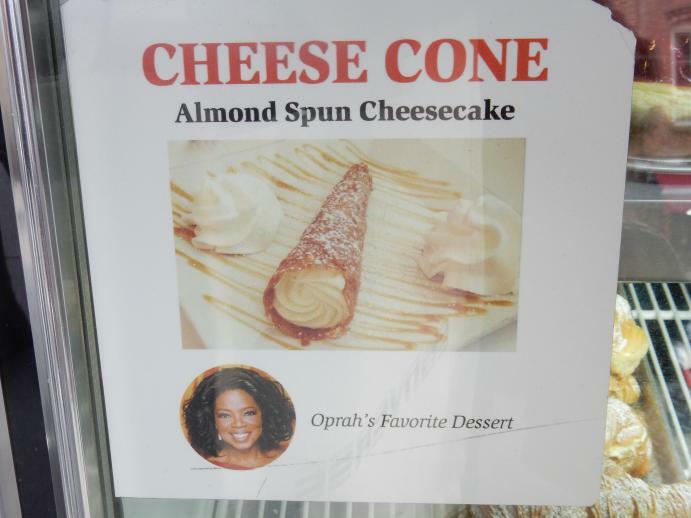 We shared 2 pastries - a lobster tail and an almond spun cheesecake cone. This was one of the nicest things I have ever tasted!!! Little Italy led into Chinatown. As we walked around, we were asked numerous times if we wanted handbags, watches or sunglasses. These were just people on the street. I don't understand why they are so undercover but others are selling the fakes openly on 5th & 6th Avenue. We caught the train back to Rockefeller & fought our way through the crowds back down 50th. We stopped at the Empire Steakhouse for a couple of cocktails before going back to the hotel. Robyn had read an interesting article about the Empire. The building had originally been built as an Opera House and had then become a venue for up and coming artists to perform. It is where Mariah Carey performed her first showcase. It was a very mild day and we didn't need gloves & hats at all. Tomorrow it is forecast to rain until the afternoon.